Thank you for sharing this article and your insights in this questionable tourist industry. Thanks for your thoughts, as always. Hope you’re enjoying the weekend somewhere wonderful. Fascinating and great photography…brings the story to life. Hey Kevin! I haven’t been to Kenya yet, but I can’t wait to go there someday. Hope to meet you and take you up on your offer. 🙂 Nice blog you have — your thoughts, voice, interest in protecting nature are so needed in this world. I look forward to reading more from you! Thanks for getting in touch. This is really an eye opener. Thanks for sharing, Kelly. Thanks, Daeng! Hope all’s well in Singapore! I rarely read opening quotations for some reason (I think I want to get to the meat! ), but this one really grabbed me. It, along with your observations and ruminations, is certainly thought-provoking. All these years of being vegetarian, I have rarely paused to think hard about leather (and when I have, I quickly and conveniently divert my mind because I like leather!). These kinds of jobs in and of themselves make me think in a terribly circular loop; as you say, they are born into them and probably have few other options, so should our squeamishness and larger-world concerns push us to change things outside our own sphere (whether by not buying or trying to change the industry), or do we squeeze our eyes closed and hope for the best for them? Travel opens up so many beauties and pleasures but also plenty of inquietudes! Very thoughtful post Kelly, and wonderful photographs as usual. 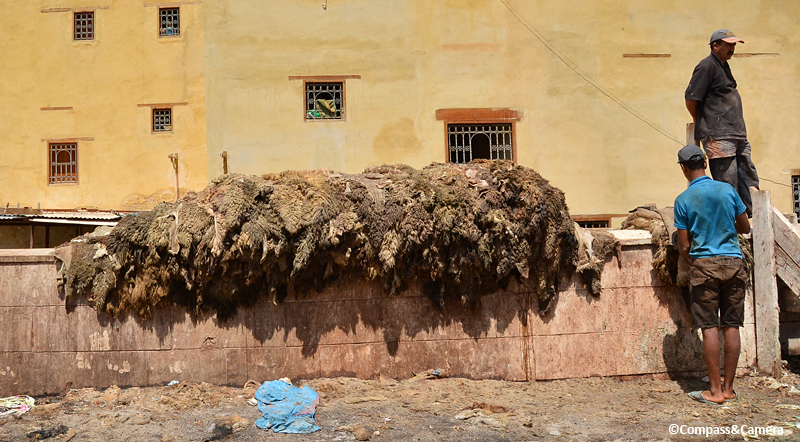 I remember visiting the Fez tanneries when I was 30, and with nothing like the awareness that I have now of the inequities of life, and the things people endure to survive. What I remember the most is the smell. I bought a small duffel bag, one of the beautiful soft leather bags Morocco is famous for, without a thought as to the suffering that went into making it. It saddens me, not least because there’s no easy answer. Even perhaps some strict laws about protective clothing would probably go a long way towards improving things though I can’t imagine that happening in Morocco. I think of so many people all around the world who work in the most dire situations. I wish I had a magic wand. Thanks for your thoughts, Alison. Exactly right — no easy answer, although I do have some hope for Morocco. 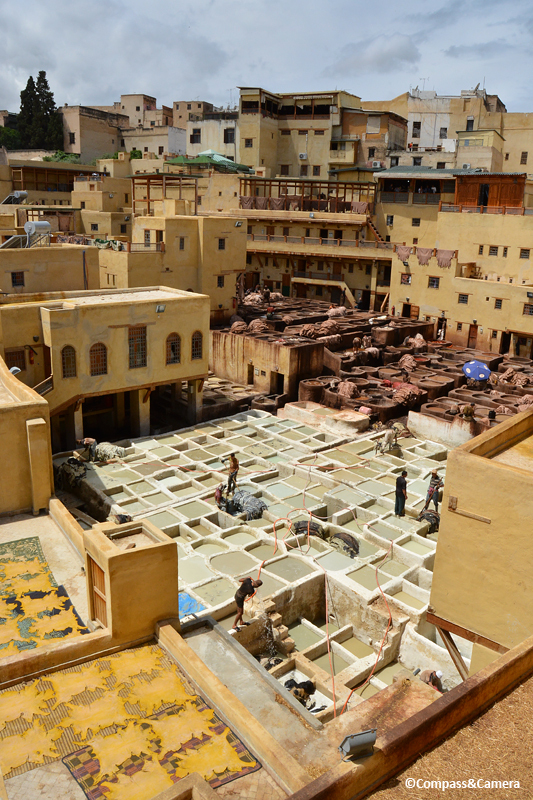 I read recently that somewhere in Fez they’ve built a plant to remove some of the metals released in the water from the processes of the tanneries. Seems like a positive step but it doesn’t really help the average worker who is standing in chemicals all day long. I’m not surprised you remember the smell — it’s unlike anything anywhere. Thanks for your thoughts! Hope you’re well. This kind of job reminds me of what the men in Kawah Ijen in East Java do for a living. Despite the noxious gases, they go down the crater to quarry solid sulfur and carry big chunks of yellow slabs over their shoulder up and down the mountain every day. “Do I really need a pair of those blue Moroccan slippers?” this is a kind of question I constantly ask myself whenever I travel to places where the locals have to resort to very demanding jobs to make ends meet. I can imagine myself asking the same question when I go to Fez one day; on one hand I know the damage those chemicals cause to the local men’s bodies. But on the other hand buying those products would supposedly help the local economy. I usually end up not buying, because I don’t know where to put them in the house. As much as we ‘discover’ and learn new things when we travel, it seems like we’re also inevitably confronted with situations like this where the answers to our questions are anything but obvious. Thanks for this thought-provoking post, Kelly! This is a kind of post that reminds us to always question our values. Hey, Bama! I vividly remember your blog post on Kawah Ijen. I came away with the same kinds of thoughts you’ve shared here. I think it all comes down to a universal human truth — we all do whatever it takes to get through life and sustain ourselves with the basic necessities. I’m sure if I were a worker in Kawah Ijen or Fez I would do the same thing. And I really think it’s fundamental that we all understand that about each other. You’ve nailed the conflict — do you say no and cut the demand for the product or say yes to support the person producing it? It is a very hard question. But in Fez, at least, I felt that any money I spent on leather would more likely fill the pockets of the shop owner, with little chance for it to trickle down to the guys in the tubs. Heartbreaking, on so many levels. Thanks for sharing your insightful comments. Always a pleasure to hear from you! The quote you have used here really nails it about travel. This eye-opening view of the behind the scenes situation in tanneries is of course just one example of the horrendous conditions endured by so many people around the world as human beings try to care for their families….and in the news again, just this morning about child labor in the collection of cobalt used in most of our tech gadgets. The underbelly of the world is hard to witness and leaves one torn with conflicting viewpoints; nothing is ever clear-cut. The coal industry here in the USA is one example of our own exploitation of generations of men. Travel raises our awareness and is the teacher for our consciousness. Thanks for sharing your thoughts! It’s hard to remain hopeful when so many industries require child labor, unsafe working conditions and the exploitation of natural resources and ecosystems. Solar and wind power seem like positive developments amidst a lot of bad news but in developing countries, the cheapest options (like coal) are often the only options — and are often the most damaging, too. We have such a long way to go. What a revelation! This is a side of Fez I would never imagine and have not seen anyone talk about. There is something both horrible and poetic in your photographs of the tanning pools nestled among the living quarters. I reflect on the unhealthy working conditions of the leather workers, but also of how they rely on this industry as they have no other livelihood. Thank you! Horrible and poetic sums it up perfectly. This was a hard post to write for the exact reasons you’ve mentioned. It’s an unhealthy industry but these men need a way to earn a living. Thanks for sharing your thoughts! Beautiful story and photos you shared. I visited that place around 5 years ago but I still remember clearly the smell. 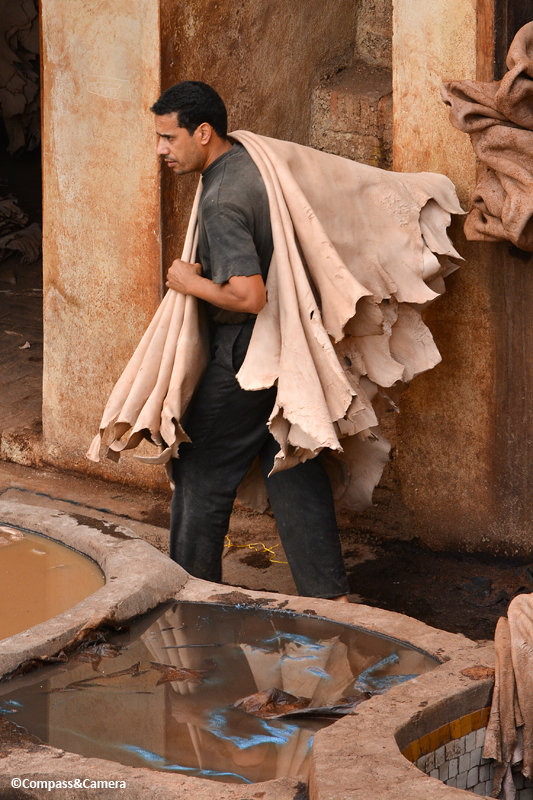 But indeed, it’s precious experience to see the tannery itself. It’s kind of amazing how the smell is such a strong, unforgettable memory for people who have visited these tanneries. Thanks for reading and sharing your thoughts, Nurul! Amazing. I will think twice before purchasing leather products! “Centuries of practice”. There are those who would suggest centuries of practice implies an ancient wisdom, and to change it would be to spit in the face of tradition. Yet much of what we’d consider modern progress is based on doing exactly that, sometimes introducing a different evil. Where to draw the line? It seems like change is needed to make it at least a little less hazardous, but I suspect it’ll take baby steps. Dave, thanks for your insightful comment on this post. You make a great point about tradition vs. progress. That applies to just about everything these days! Thanks for reading and sharing your thoughts. 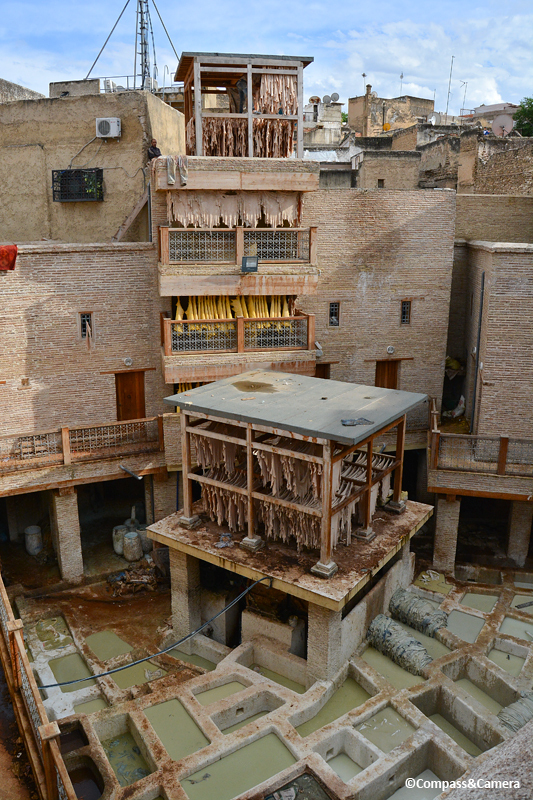 Thank you Kelly for such a thoughtful post on the tanneries in Fez. And fascinating photographs too! We visited about ten years ago and it is not an experience one can easily forget. And your post brought back all the visuals, the stench, the morbid fascination. In addition to the horrors brought about by inhaling and skin absorption of toxins that the workers endure, I could not help but be put off leather by the acknowledgement of the death of so many living creatures to satisfy the leather demand. It is as you say, that when one sees it and the reality sinks in that we can have an educated response to the many industries and products that most of us do not think about, before making a purchase. If there was less demand, less animals killed, less workers poisoned. I know it is not happening and I know that the workers rely in their jobs to make a basic living. No easy answers. Peta, I’m so late in responding but thank you for your thoughtful comment on this post. It’s an endless cycle, hard to disengage from. Every little bit of awareness helps. Thanks for reading. Hope you and Ben (and Nilu!) are well. ~K. Not all riches of knowledge that come from traveling the world, are always pleasant. But, still fascinating nonetheless. Hey Kevin! Sorry for the late reply. Love your comment — true and well said. Thanks for reading. I’ve been swamped with work. Hoping to post some new content soon! No worries. Been swamped myself. Fascinating post, Kelly, the opening quote sets the stage very well “One looks, one listens, one is roused to enthusiasm by the most dreadful things because they are new…” Your photos and words mesmerize, there is beauty in all you show ~ with the obvious sadness being the people exposed to dangerous conditions without a second thought. A common plight in poorer communities around the world. And you also mention VF Corporation, which is one of my downstream customers, and while there are continual regulations/certifications/etc… to ensure the improvement of conditions, there is still a long way to go. Great post. Hey, Randall! Great to hear from you. Just catching up with comments tonight after a loooong bout of work and deadlines has kept me away from the blog. Thanks so much for your comment. That intro quote did all the work for me, I think! Such profound truth in that statement. Interesting to share a VF connection with you. Agreed — still a long way to go, all over the world. Hope this finds you well wherever you are! ~K. Another Wow! I do remember the smell of rotting flesh outside the tannery., Reminded us of something medieval, except for how hard it was to find alcohol! Travel broadens our thoughts for sure. Ha! Thanks, Ron! It is indeed a challenge to find a beer or glass of wine. We brought a bottle of gin from Spain which made all of our sunsets a little more beautiful. 🙂 Thanks for reading and sharing your thoughts! Your road trip looks AMAZING, btw. We just left BC and considered a similar trip before we left. No doubt you are having a blast! The wilderness is second to none. ~K. Tomorrow we drive and camp along the Denali Highway, supposedly one of the most scenic drives ever. Love BC too! Sounds incredible!! Enjoy every minute!